The Challenge didn’t get off to the best of starts. After I had my 3rd dinner at 11.58pm last night (Being Prepared – the only thing I took away from my failed career in Girl Guiding) I was stricken by a terrible realisation. If I was going to eat any lunch the next day I was going to have to make it there and then. Not so Prepared after all. 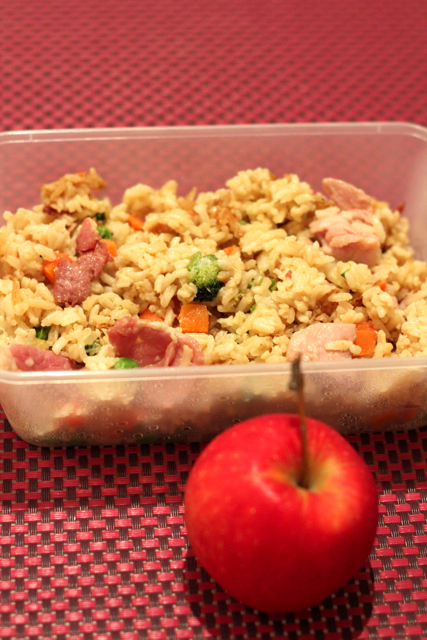 Cue mad scramble to cook rice from scratch then fry it all up at 12.30am on a schoolnight. All soggy still, but whatevs, needs must. Guan: Have you lost your mind?! Then it was fine. I made it through the day. I made it! Discernibly in one piece. Can’t say the same for the bacon. Each rasher disintegrated into several shards on contact with a fork. No wonder it is £1.09… But it tasted ok, yo. Don’t mess. Right. As promised: a head-to-head comparison of F&B logs from this Monday vs last Monday 8 April 2013. *Disclaimer: I was on annual leave Mon-Weds last week, hence the ability to eat out for a truly lovely weekday lunch. I don’t quite have the sort of day job that would allow this to happen on a daily basis. Fortuitous timing though – more moolah for me to match for Action Against Hunger. 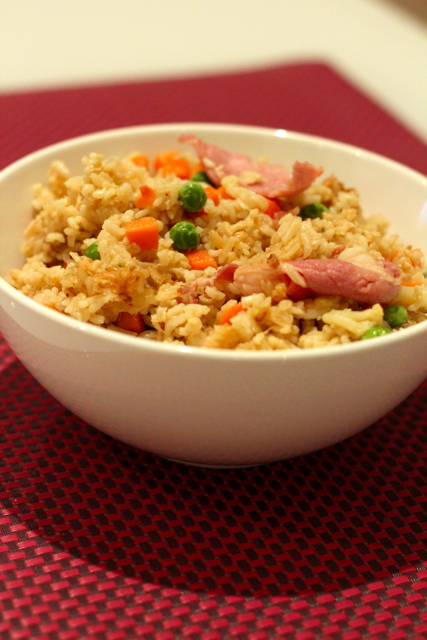 Funny how a decent camera can make this look so appetising. 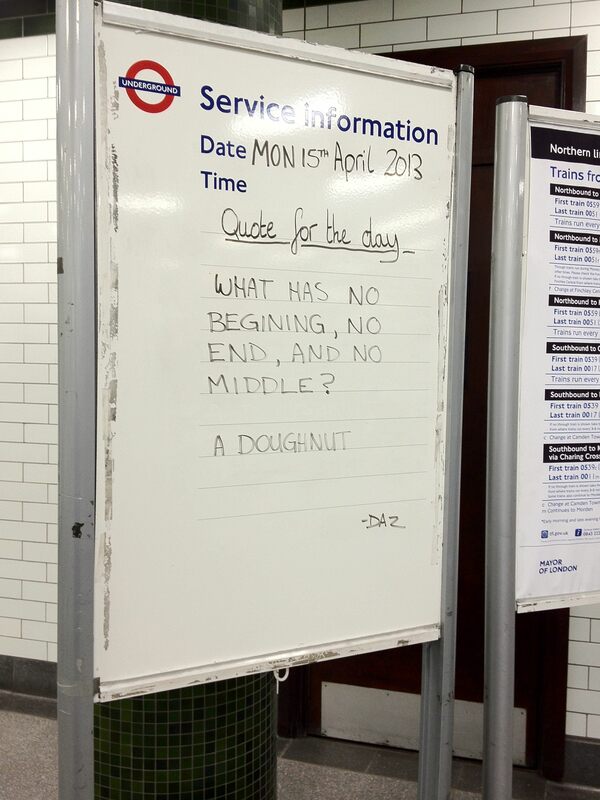 Of all the 365 days of the year, the Tube station closest to work HAS to issue a food-related Quote of the Day today. 2) But more importantly, one is reminded that there are 30p jam doughnuts at Beigel Bake. Hoho. If I keep going with the savings I may just be able to afford one this Wednesday. Hmm!! Time for some careful plotting. More tomorrow. Eat well everyone. I know I’m trying to! Love your peekture … a Wednesday doughnut is surely on the cards. Keep going!